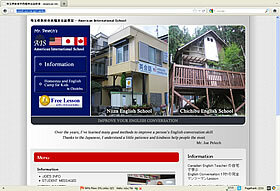 English lanuage school and English camp based in Niiza and Chichibu. Mr. Jeremy Cowling's web design work is fast. He quickly redesigned my old web site in a few days. Clearer information. Better color. A more professional look. No delays. No excuses. And everything at a reasonable price. I think Jeremy is Japanese. A job well done! Thank you!